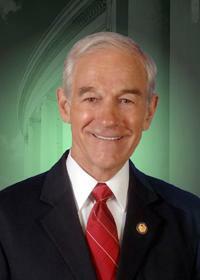 Ron Paul has always stood out. He was a star athlete as a Green Tree, Pennsylvania, high-school student, winning state championships in track. He worked his way through Gettysburg College with three simultaneous jobs, and was a straight-A student as well. He earned similar grades at Duke Medical School, and after serving as an Air Force flight surgeon, set up a successful OB/GYN practice in Lake Jackson, Texas, where he delivered more than 4,000 babies. Dr. Paul began his life-long interest in Austrian economics, libertarianism, and non-interventionism in medical school, and when Richard Nixon imposed price and wage controls, and severed the remaining tie between the dollar and gold in 1971, Dr. Paul determined to become a public intellectual, running for Congress and speaking out and writing in defense of his ideals, winning a reputation as the entirely principled member of the House, and an expert in economics, history, and political philosophy. He was chairman of the Domestic Monetary Policy Subcommittee, and was also known as the one Member who really understood central banking, and a feared opponent of the policies of Alan Greenspan and Ben Bernanke. Dr. Paul is the author of 10 books: Gold, Peace, and Prosperity, Abortion and Liberty, The Case for Gold, Mises and Austrian Economics, Freedom Under Siege, A Foreign Policy of Freedom: Peace, Commerce, and Honest Friendship, Pillars of Prosperity, The Revolution, End the Fed, Liberty Defined, and The School Revolution. He ran for president in 1988 as a Libertarian, and in 2008 and 2012 as a Republican, gaining nationwide and worldwide support for the ideas of freedom, peace, and prosperity, especially among the young, despite a media-wide campaign to ignore him, and then distort him. He is looked to as the leader of the freedom movement in a host of countries. Click here to read 26 reasons why you should enroll your children in the Ron Paul Curriculum.